Last week I had a really great conversation with a client about weekend eating, so I thought it might be helpful to do a Why I Ate Wednesday post about it. Some of the themes that often pop up in conversations on weekend eating are fears and anxieties about planning ahead for social events where food is an unknown, or overdoing it when alcohol is involved. Since I had a few plans where food was an unknown and rose by the pool was a known, I thought documenting my Saturday might be helpful. Disclaimer: This post is not meant to be an eat-like-me kinda post. My goal is to give you a behind the scenes on intuitive eating, sharing what guides my decision making about food and how that plays out on the plate. I had plans in the morning to go to Soda City Farmer's Market with the hubs and my sister-in-law, who is in town for a couple months of her maternity leave from Sebastopol, CA. I knew we'd be eating breakfast there, but I wasn't 100% sure what time we were going since I had to wait for a delivery that was scheduled between 8-12. So I decided to just have a KIND bar to hold me over. Thankfully the delivery came on the earlier side and I didn't have to wait too long for breakfast. If you're not from Columbia (or if you are and somehow haven't made it to Soda City - if so, SHAME! ), we have the most fantastic farmer's market that takes over three blocks of downtown every Saturday morning. It's food choice overload, because there's so many delicious food trucks and I just want to eat them all, but my usual go-to is one of the South American or Mexican stands for pupusas, arepas, or tacos. That's kinda what I wanted, but my sister-in-law wanted avocado toast, so we went with that. Sure, I could have gotten in line for my first choice, but both lines were long and I wanted to spend more time with my sister-in-law. With Intuitive Eating, it doesn't mean you're always eating the exact food you want most in the world all the time - but it's okay because I know I can eat pupusas, arepas and tacos basically any day of the week. And y'all, I'm not sad about it either, because our avocado toast stand makes the most perfect avocado toast - their sourdough bread is everything! I got mine half cucumber and half mango salsa, and it was really refreshing and satisfying on a hot morning. Also refreshing - a cup of strawberry lime kombucha with just the right sweet/tart balance. After the farmer's market, we had some down time before heading to a friend's pool party. I was hungry before we left, and I knew there would be a low country boil there, but I wasn't sure when, so I decided to have a mini-meal. We didn't have much in the house since it was the weekend and I hadn't gone grocery shopping, but I had just gotten a delivery of food from Nestle earlier that day with some Lean Cuisine frozen meals in it, so that's what I had. Now, I know you might be shocked to find Lean Cuisine on this Intuitive Eating blog. And truthfully, it's not a brand I buy myself because of the marketing, but at the end of the day, it's just food. It's just not enough for me (or most people) for a meal, so if I wasn't heading to a party where more food would be available, I would have added something else to it. From there, we spent the afternoon at my friend Shannon's pool party. There were some snacks out, including some really delicious ripe watermelon and boiled peanuts, which I snacked on. If you're not from the South, boiled peanuts might be new to you. They taste like salty boiled little potatoes to me! Also sipped on a glass of rose and my favorite key lime gose by Westbrook. It's basically the margarita of beers. Plus lacroix. Always lacroix by the pool. The main event was a big pot of low country boil, which is basically a bunch of seafood boiled in water with seasoning, potatoes, corn and sausage. They added a package of Benton's bacon so it had a really great smoky flavor. The boil was so delicious, although I wish I ate a little bit more. I was probably at a six on the hunger/fullness scale when I stopped. Sometimes when I'm eating and sharing food with other people, I have this irrational worry that if I eat "too much," other people won't get enough to eat. See, even us seasoned Intuitive Eaters still have things we're working on! The party ended around usual dinner time, but we had just eaten low country boil, so no one was in the mood for a meal. A group of us decided to grab another beer at Columbia Craft. Another sour beer for me - my favorite in the summer. I started to get pretty hungry though after I had my beer, but we were still meeting on one person to meet up with us. By the time everyone was ready to grab food, I was uncomfortably hungry, probably a 2 on the hunger scale. So considering that + having a few drinks in my system, when it was time to make a decision on what to eat, it's probably no surprise that pizza and cheese sticks were calling our name! So we went to Nightcaps - literally the seediest bar you've ever seen, but y'all, they make the best cheese sticks I've ever had in my life. My friends and I always joked that we didn't know if the cheese sticks are actually as good as we thought they were, because Nightcaps is typically only a late night kinda place. But once I had them in the middle of the day, and yes, they were just as magical. Guys. I promise you. These are one of the best bites in Columbia and I'm not even kidding. Ordered a veggie and ham pizza minus the ham because I don't like meat on pizza other than prosciutto. Weird, I know. I think it would be pretty easy to look back at my day and say "if only you planned better" or "if only you ate enough at the party" or "if only you had a pack of 10 almonds in your purse" then maybe you wouldn't have ended the day with pizza and cheese sticks. But also, I like pizza and cheese sticks and I don't think there's anything wrong with eating pizza and cheese sticks on occasion. 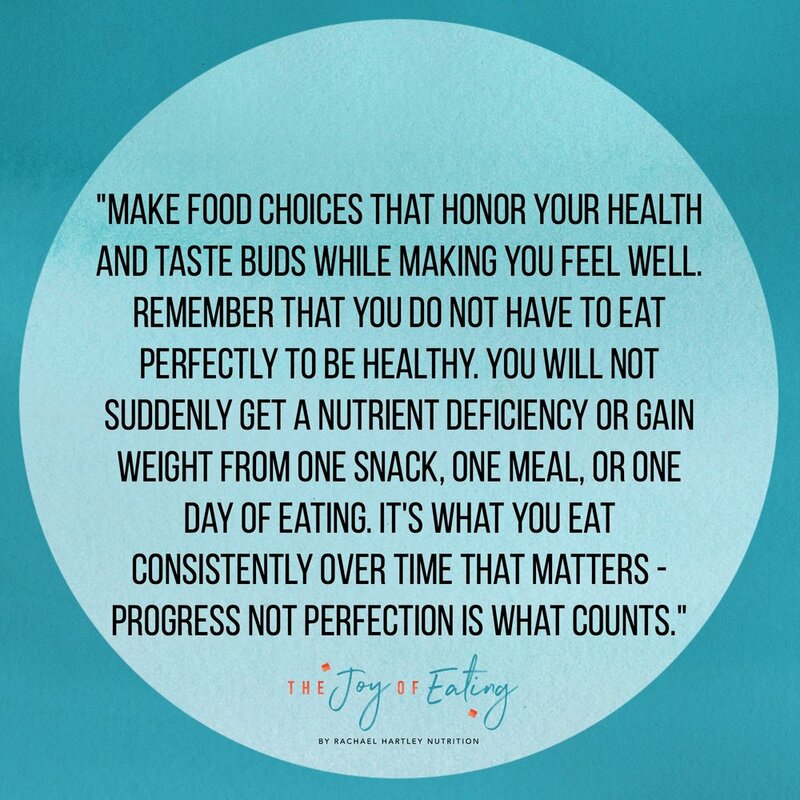 Some might even label my day of eating "unhealthy," but of course, here at The Joy of Eating, we look at health with a much broader lens than just food! I got lots of sunshine, was active outside, spent lots of quality time with people I love, and had at least 47 belly laughs. So I think there was a lot that was quite healthy about my day!